This year has been the warmest Winter season that I can remember having here in the Pacific Northwest. We are embarking on Spring and not one flake of snow ever appeared to give us any clues we’ve experienced winter, except for one thing. The flu. It’s season is still running rampant. I thought this would be the perfect opportunity to share with you a soup that is beautiful and nurturing in so many ways. I actually cooked up a batch early last fall then popped it in to the freezer for such an occasion as this where I am need of sustenance. So as it’s simmering on the stove, I’m going to chat a little bit about the wonderful goodness of Tom Kha Soup. I came upon this wholesome soup via one of my favorite sites, Learning Herbs dot com. You’re probably aware of the recent rediscovery of bone broth, the staple of our great grandmother’s kitchens, and were amazed at how simple, frugal and extremely healthful it is to practice this old way of feeding yourself and your family. Bone broth could be one of the most beneficial additions or change in your diet for optimal health. 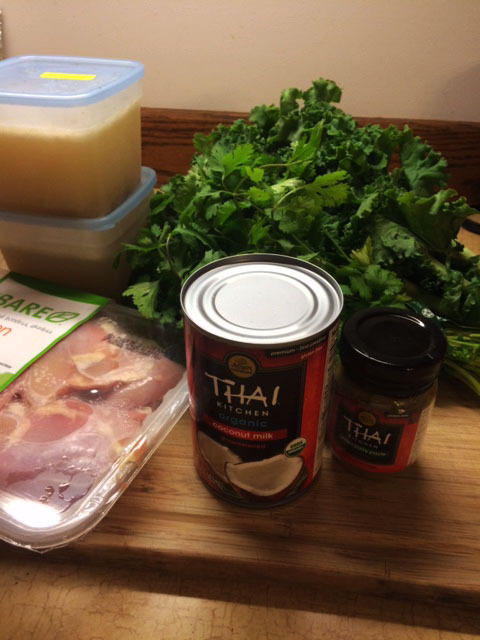 Get the recipe right here from Nourished Kitchen and let a good bone broth be the base for your Tom Kha soup. I’m not sure about the origins of Tom Kha Soup, but it’s Thai influence is unmistakable with it’s plentiful inclusion of garlic, ginger, curry paste, Tamari, Shitake mushrooms and uber satisfying Coconut milk. The recipe calls for Lemongrass as well but because it was not readily available I substituted with a strong herbal tea from my stash of dried lemongrass as recommended. If the delightfully warming and healthy properties of garlic and ginger doesn’t persuade you to trying your hand at Tom Kha Soup. Perhaps the abundance of greens will. 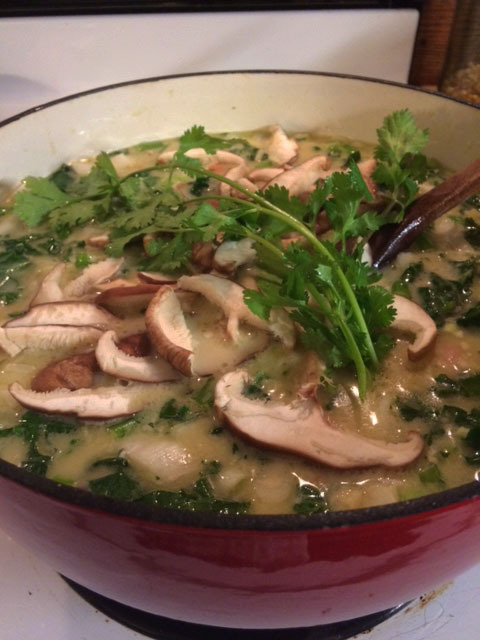 Full bunches of bok choy, kale, cilantro and green onions contribute to the soup’s flavor and nutritional properties. Nothing helps put you on the mend faster after an illness as prebiotic rich green foods. A mid winter binge on Tom Kha Soup even when your feeling well serves to promote the health of your digestive system, fortifying your resistance to flu and cold viruses. Get the recipe from Learning Herbs then safeguard it in your home “food as medicine” file. Three things that I let go of reluctantly at Winter’s end: A warm fire, my down comforter, and Tom Kha Soup. This entry was posted in Kitchen Stuff and tagged health, recipe, Soup, Tom Kha, winter.